If you’re a coin collector, numismatist, or somebody who has worked a bit with coins, then you may have heard the acronym PMD. It stands for Post Mint Damage, and refers to any damage a coin has suffered after leaving the mint. …that were not there when the coin left the U.S. Mint. Post Mint Damage (PMD) and Post Strike Damage (PSD) are often mistaken for errors on U.S. coins. I’m going to help you tell the difference. A lot of people think that circles, lines, or grooves on a coin make the coin rare and valuable. However, these are not coin errors. Coins experience so much wear and tear throughout their lives, and many end up taking quite a beating in the process — resulting in PMD. Sometimes, signs of coin damage look unusual to an unassuming coin collector, who mistakes PMD (or PSD) as a Mint error. If the “error” cuts into the coin (it goes into the surface rather than being raised), then it’s probably Post Mint Damage. If the coin has a raised blob of metal next to or near a groove or cut, that’s probably Post Strike Damage, too. If it’s a two-headed coin (with the face of a penny on one side and a dime on the other side), that’s an altered coin made for magicians — which is considered Post Strike Damage. If there is doubling on the coin… it’s tricky. In most cases, doubling is not caused by the coin being a doubled die, but rather damage from the strike itself. So, if you see doubling all over the coin (and definitely if it appears on both sides), then it’s not a doubled die but machine doubling instead. Another major cause of PMD is cleaning… Yes, cleaning your coins actually damages them. While many people think it’s a good thing to clean their “dirty” or old coins, it’s actually one of the worst things you can do. The bottom line… leave your coins in their natural state. Don’t clean your coins! What Should You Do With PMD Coins? Unfortunately, there isn’t much you can do with Post Mint Damage except enjoy the damaged coin for what it is — a broken coin that needs a home and some love. You can’t “fix” PMD coins. That doesn’t mean damaged coins are worthless though. 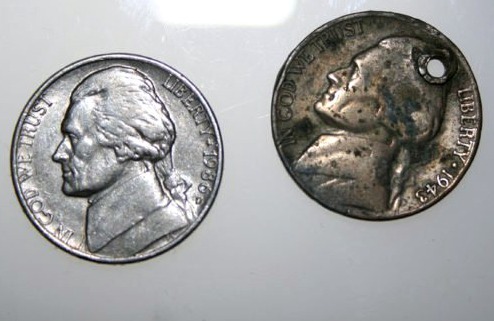 Damaged coins make terrific “fillers” for hard-to-find coins in your collection! Since PMD coins can often be bought cheaply, they’re great for filling holes in your coin folders and coin albums — where otherwise rare and/or expensive coins would go. Coins with Post Mint Damage (also referred to as cull coins) cost only a fraction of the price of similar coins in problem-free condition. This makes PMD coins desirable for coin collectors on a budget who want to buy old coins or rare coins without paying full price for them. One thing to keep in mind (especially if you’re hoping to make an eventual profit on your coins) is that damaged coins don’t usually increase in value as quickly as problem-free coins. Therefore, it might be best to save up your money and buy a nice, problem-free example when you have the money to do so. The general rule on coin values is that coins are ultimately worth what someone will pay for them. Damaged 20th-century silver and gold coins are often only worth the value of the metal in the coin (or their spot value). However, damaged rare coins are usually worth much more than their metal value. Take the 1909-S VDB penny, which has about 2 cents of copper value. Even a corroded 1909-S VDB cent that has been cleaned, bent, and has holes (a pretty ugly-looking 1909-S VDB penny, really…) might be worth $100 to $200 as a filler piece — because demand for the rare Lincoln penny is so high! A porous, bent 1793 Chain cent (a very rare penny that was the very first official Federal United States coin) can bring $1,000 or more, so long as it’s identifiable as a Chain cent. And holed, cleaned Draped Bust silver dollars from the 1790s or early 1800s often sell for $300 to $500. The bottom line?… Values for damaged coins range all over the board. Remember, one collector’s trash is another’s treasure!